Peddle G.D., Buchanan J.W. Acquired atrial septal defects secondary to rupture of the atrial septum in dogs with degenerative mitral valve disease // J Vet Cardiol. 2010 Aug;12(2):129-34. 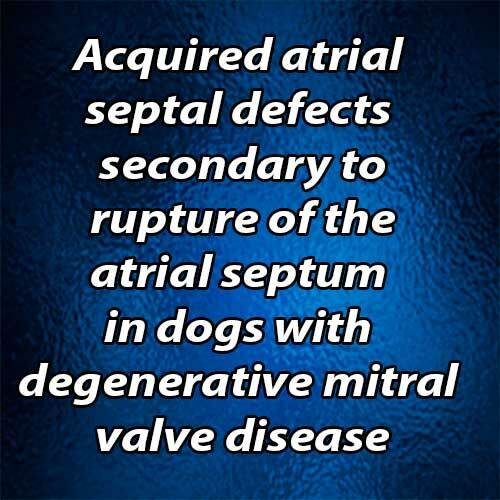 Acquired atrial septal defects (ASDs) secondary to atrial septal rupture are uncommon in dogs with degenerative mitral valve disease. Echocardiographic diagnosis of these defects has not previously been described. The echocardiographic features in two cases identified antemortem are presented in this report. ASDs can be difficult to identify on two-dimensional echocardiogram when relatively small in size and may be underreported. Acquired ASDs may alter the physiology, treatment plan and prognostic implications for the dogs in which they occur and their presence should be considered in all cases of degenerative mitral valve disease that develop signs of right-sided heart failure. A 5.3 kg, 11.5-year-old spayed female Cavalier King Charles Spaniel was referred to our hospital for acute abdominal distension. The dog had presented to the local veterinarian for coughing two months prior and had a 1 year history of a left apical systolic heart murmur. Cardiovascular examination findings included tachycardia (HR: 150 bpm), grade V/VI left apical systolic murmur, jugular vein pulsation, split second heart sound, abdominal fluid wave, and cachexia. Thoracic radiographs indicated enlargement of the left ventricle, left atrium, right ventricle [vertebral heart size (vertebra = v): 15.6v (reference range: 8.7—10.7v)], caudal vena cava and pulmonary veins, compression of mainstem bronchi, hepatomegaly, and decreased abdominal detail. A heartworm antigen test was negative. A 5.1 kg, 8-year-old, spayed female Chihuahua presented to our service for abdominal distension and lethargy. Therapy for left-sided congestive heart failure (furosemide and enalapril) had been initiated by the primary veterinarian two months prior and the dog had a 1 year history of a left apical, systolic heart murmur. Cardiovascular examination findings included tachycardia (HR: 210 bpm), a grade V/VI left apical, systolic murmur, weak femoral pulse quality, jugular vein pulsation, respiratory effort, abdominal fluid wave and cachexia. Electrocardiography displayed sinus tachycardia with intermittent paroxysmal supraventricular tachycardia (SVT) (maximum SVT rate: 250 complexes/min). Thoracic radiographs indicated enlargement of the left ventricle, left atrium, right ventricle (vertebral heart size = 13.4v), caudal vena cava and pulmonaryveins, compression of the left mainstem bronchus, hepatomegaly, and decreased abdominal detail. In both dogs, there was no radiographic evidence of left-sided congestive heart failure, and abdominal fluid analysis was consistent with a modified transudate. Clinical diagnoses were consistent with right-sided congestive heart failure and myxomatous atrioventricular valve degeneration prior to further diagnostic imaging. A standard echocardiogram3 was performed in both dogs (dog 1 under sedationb). Two-dimensional echocardiogram identified eccentric left ventricular hypertrophy, hyperdynamic left ventricular systolic function, right ventricular enlargement, biatrial enlargement, thickening and prolapse of all leaflets of both atrioventricular valves, and scant pericardial and abdominal effusion. A 1.5 mm defect (on short axis) was identified in the atrial septum (Fig. 1A). a Philips Sonos 7500, Philips Medical Systems, Bothell, WA. b Butorphanol 0.2 mg/kg IV, midazolam 0.2 mg/kg IV. A 1.5 mm defect in the atrial septum is identified in A (arrow). A high velocity, continuous left-to-right atrial level shunt across this defect is documented in B (diastolic frame) and C. Ao = Aortic root, LA = Left atrium, RA = Right atrium. Color flow Doppler study identified eccentrically directed severe mitral (directed towards the left atrial free wall) and moderate tricuspid (directed towards the atrial septum) regurgitation, and mild pulmonic regurgitation. A left-to-right shunting continuous jet of aliasing color flow was noted in the right atrium originating from the defect in the atrial septum (Fig. 1B, Video 1). Spectral Doppler study indicated increased peak transmitral E and A wave velocities, decreased peak aortic and pulmonic outflow velocities, and tricuspid (peak) and pulmonic (end-diastolic) regurgitation velocities consistent with pulmonary hypertension (peak systolic right ventricular—right atrial pressure gradient = 63 mm Hg, end-diastolic pulmonary artery—right ventricular pressure gradient = 49 mm Hg). Peak systolic and diastolic velocities across the atrial septal defect were 3.1 m/s and 1.8 m/s, respectively, corresponding to peak systolic and diastolic left atrial-to-right atrial pressure gradients of 38 mm Hg and 13 mm Hg, respectively (Fig. 1C). Two-dimensional echocardiogram indicated eccentric left ventricular hypertrophy, hyperdynamic left ventricular systolic function, right ventricular enlargement, biatrial enlargement, marked thickening and prolapse of all leaflets of both atrioventricular valves, enlargement of the main pulmonary artery, and ascites. Color flow Doppler study identified eccentrically directed severe, mitral (directed towards the left atrial free wall) and moderate tricuspid (directed towards the right atrial free wall) regurgitation. An atypical, aliasing color flow jet was identified terminating at the tricuspid regurgitant jet in the right atrium on right parasternal short axis views. The atypical jet did not initially have an obvious site of origin and was difficult to distinguish from the tricuspid regurgitation itself. No defect was noted in the atrial septum on standard twodimensional or color Doppler views (Fig. 2A), but when the right parasternal short axis imaging window was dorsally obliqued to emphasize the cranial and caudal vena cavae, a 1.1 mm defect in the atrial septal septum was identified near the cranial vena cava (Fig. 2B) on 2-dimensional imaging. Color flow Doppler at this location indicated a continuous left-to-right shunting jet of turbulent flow clearly originating from the defect (Fig. 2C, Video 2). Transmitral E and A waves were fused on spectral Doppler study, peak aortic and pulmonic outflow velocities were decreased, and peak tricuspid regurgitant velocity was consistent with pulmonary hypertension (peak systolic right ventricular—right atrial pressure gradient = 50 mm Hg). Spectral Doppler interrogation of the left-to- right shunting ASD indicated peak systolic and diastolic velocities of 3.3 m/s and 1.6 m/s, respectively, corresponding to peak systolic and diastolic left atrial-to-right atrial pressure gradients of 44 mm Hg and 10 mm Hg, respectively. Figure 2 Right parasternal short axis color (A and C) and 2-dimensional magnified (B) echocardiographic images from dog 2. Note the smaller size and more cranial position of the acquired atrial septal defect (arrow in B) in this dog compared with dog 1 (compare to Fig. 1A). In standard short axis views used to obtain left atrial and aortic root dimensions, color flow interrogation of the atrial septum did not identify atrial level shunting (A). When these views were dorsally obliqued to enhance the right atrium and entrances of the vena cavae, an atrial level shunt is identified (diastolic frame) (C). RA = Right atrium, LA = Left atrium, Ao = Aortic root, CrVC = Cranial vena cava, CaVC = Caudal vena cava. Both dogs were diagnosed with right-sided congestive heart failure secondary to acquired left-to-right atrial level shunts, pulmonary hypertension, and myxomatous mitral and tricuspid valve degeneration. Treatment with conventional heart failure therapy (furosemide, enalap- ril + pimobendan) was initiated in both cases (dog 2 also received diltiazem therapy for supraventricular tachycardia). Dog 1 was alive at the time of this publication, 425 days following initial diagnosis. Dog 2 had recurrence of severe ascites twice in the four weeks following diagnosis and the owner elected humane euthanasia with diagnostic necropsy. Gross pathology (Fig. 3) of dog 2 confirmed the echocardiographic findings. Endocardial jet lesions were noted in the left atrium along with regions of thinning and nonperforating splitting of the endocardium of the caudal wall. Pericardial adhesions were present over some of these areas but perforation of the caudal wall was not identified. Anatomic closure of the foramen ovale was complete. A 7 mm x 3 mm, vertical nonperforating endocardial split was noted on the left atrial side of the atrial septum parallel and immediately caudal to the fossa ovalis ridge. At the ventral and caudal- most aspect of this lesion a 1 mm x 2 mm perforation in the atrial septum was noted. Numerous jet lesions and nonperforating splits were present over the remaining left atrial endocardium. 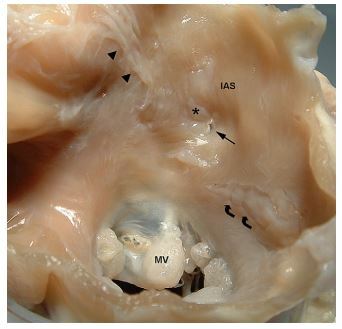 Figure 3 Dorsal view (from within the left atrium) of the atrial septum and mitral valve annulus of dog 2. The 1.1 mm acquired atrial septal defect (straight arrow) is located at the ventral aspect of a large, vertical, nonperforating, healed endocardial split (*) in the interatrial septum (IAS). Numerous endocardial jet lesions (arrowheads) and a large, horizontal, nonperforating, healed endocardial split (curved arrows) parallel to the mitral valve (MV) annulus are also present. IAS = Interatrial septum, MV = Mitral valve. Acquired ASDs secondary to MVD in dogs are rare and previously identified on necropsy and diagnostic catheterization, only.1,c In contrast, rupture of the caudal wall of the left atrium, including echocardiographic features, in dogs with MVD is well described.1—6,d In 50 dogs with left atrial endocardial splits, 11 (22%) had rupture of the caudal wall and hemopericardium while seven (14%) had acquired ASDs.1,c,d The clinical presentations of dog 1 and dog 2 were consistent with the few cases previously described.3 Difficulty in identifying dog 2’s ASD during 2-dimensional echocardiogram was attributed to the smaller size and slightly more cranial location of this dog’s defect. Significant tricuspid regurgitation on color flow Doppler can make identification of the left- to-right shunt difficult during systole. c Postmortem images available at James Buchanan Cardiology Library (vin.com/library/general/JB104atrialRupt. htm). d Buchanan JW. Chronic valve disease and left atrial splitting in the dog. Masters thesis, University of Pennsylvania; 1966. Thus, it is possible that acquired ASDs in dogs with MVD may occur more commonly than is believed or reported. In general, identification of the defects on two-dimensional echocardiography was most consistent on short axis views. It is possible that dog 1’s ASD was congenital since the dog was not previously evaluated and is alive at the time of this publication. However, the presence of a congenital ASD would have allowed the right atrium to serve as a low pressure 'sink’ for the left atrium in the early stages of this dog’s mitral valve disease and the extreme left atrial enlargement noted in this dog would have been less likely to develop, particularly given the relatively large size of the defect and shunt identified on two-dimensional and color flow Doppler imaging [shunt fractions (Qp/Qs) were not calculated in either dog due to lack of demonstrated reliability of this calculation using transthoracic imaging in dogs]. The etiology of spontaneous endocardial splitting in dogs remains unclear but is likely multifactorial, related to increased left atrial volume and pressure and mechanical trauma to the endocardium induced by the regurgitant jet. Endocardial splitting may be preceded by rupture of mitral valve chordae tendinae and genetically- influenced variations in endocardial tissue may predispose certain dog breeds to endocardial degeneration and splitting.1 ,d Specific factors may play a role in rupture of the atrial septum. The thin, slightly translucent portion of the fossa ovalis is a site of anatomic weakness in the normal atrial septum.7,d All previously documented cases of atrial septal rupture in dogs occurred in close proximity to the fossa ovalis, most commonly as an extension of a nonperforating split in the caudal wall.2,d Experimental (dogs) and clinical (humans) echocardiographic studies of acute mitral regurgitation secondary to chordae tendinae rupture demonstrated a characteristic pattern of exaggerated motion, systolic fluttering, systolic premature anterior motion, and increased amplitude of motion of the atrial septum (reflecting an increase in systolic left atrial-to-right atrial pressure gradients) in these patients.8,9 These motions may create additional mechanical stress on the atrial septum that could contribute to rupture. In contrast to rupture of the caudal wall causing hemopericardium, rupture of the atrial septum may offer a hemodynamic advantage to a dog with elevated left atrial pressure by providing a low pressure "sink” into which the left atrium can unload similar to that which occurs in Lutembacher syndrome in humans (mitral stenosis with congenital or acquired ASD).10 The left-to-right shunting of blood causes volume overload to the right side of the heart, elevated systemic venous and pulmonary arterial pressures, and potentially right-sided heart failure, which is rarely acutely life-threatening and can be managed more easily than left-sided heart failure in dogs. Size of the ASD, transatrial pressure gradient, and relative compliances of the left and right ventricles will impact the degree of shunting. Peak velocities across the ASDs were relatively elevated in both dogs reported here despite the presence of right-sided heart failure, emphasizing the significant elevations in left atrial pressure present in each dog. Buchanan JW, Kelly AM. Endocardial splitting of the left atrium in the dog with hemorrhage and hemopericardium. J Am Vet Radiol Soc 1964;5:29-39. Buchanan JW. Spontaneous left atrial rupture in dogs. Adv Exp Med Biol 1972;22:315-334. Beardow AW, Buchanan JW. Chronic mitral valve disease in Cavalier King Charles Spaniels: 95 cases (1987-1991). J Am Vet Med Assoc 1993;203:1023-1029. Komitor DA. Left atrial rupture infrequent sequel to chronic microvalvular insufficiency. Vet Med Small Anim Clin 1976; 71:620-621. Johnson MS, Martin M, BinnsS, Day MJ. A retrospective study of clinical findings, treatment, and outcome in 143 dogs with pericardial effusion. J Small Anim Pract 2004;45:546-552. Reineke EL, Burkett DE, Drobatz KJ. Left atrial rupture in dogs: 14 cases (1990-2005). J Vet Emerg Crit Care 2008;18:158-164. Thors A, Guarneri R, Constantini EN, Richmond GJ. Atrial septal rupture, flail tricuspid valve, and complete heart block due to nonpenetrating chest trauma. Ann Thorac Surg 2007;83:2207-2210. Tei C, Tanaka H, Makao S, Yoshimura H, Minagoe S, Kashima T, Kanehisa T. Motion of the interatrial septum in acute mitral regurgitation. Circulation 1980;62:1080-1088. Lin CS, Chen HY, Jan YI. The interatrial septal echocardiogram: relationship to left atrial volume change in the normal and diseased heart. Am Heart J 1984;107: 519-525. Ho CL, Liang KW, Fu YC, Jan SL, Lin MC, Chi CS, Hwang B. Transcatheter therapy of Lutembacher syndrome. J Chin Med Assoc 2007;70:253-256.